You can watch all movie. Tokyo: The first dolphins of the season have been slaughtered in the small Japanese town of Taiji, campaigners say, starting an annual cull highlighted in the Oscar-winning documentary The Cove and repeatedly condemned by animal rights groups. Activists from the environmentalist group Sea Shepherd have been monitoring a bay in Taiji, southwestern Japan, since the six-month dolphin hunting season began earlier this month. "First pod of 2014-2015 being driven into cove now," the activists from Sea Shepherd, who call themselves "Cove Guardians", posted on Twitter at 10.33am local time. About an hour later, @CoveGuardians on Twitter said: "First dolphin murder of the drive hunt season is complete as dead bodies are dragged to Taiji butcherhouse." There were no details on the number of kills. The local fishermen's association said they could not immediately confirm the report. The campaigners are streaming live footage of a secluded bay into which local fishermen corral hundreds of dolphins for slaughter, a practice that thrust the small town into the global spotlight in 2010 when it became the subject of the Oscar-winning documentary The Cove. Defenders say it is a tradition and point out that the animals it targets are not endangered, a position echoed by the Japanese government. They say Western objections are hypocritical and ignore the vastly larger number of cows, pigs and sheep butchered to satisfy demand elsewhere. But critics of the practice say there is insufficient demand for the animals' meat, which in any case contains dangerous levels of mercury. The annual dolphin hunting season opened on September 1, and is expected to continue until the end of February. The first dolphins of the season were slaughtered Tuesday in the small town of Taiji, Wakayama Prefecture, campaigners and a local fishermen’s union said, commencing an annual cull repeatedly condemned by animal rights groups. Activists from the environmentalist group Sea Shepherd have been monitoring a bay in Taiji since the six-month dolphin season began earlier this month. “First pod of 2014-2015 being driven into cove now,” the activists from Sea Shepherd, who call themselves “Cove Guardians,” tweeted at 10:33 a.m.
An official from the local fishermen’s union confirmed they had made the first catch of the season. “We caught 12 Risso’s dolphins,” he said, adding they had already been killed for their meat. There were no dolphins left in the bay, he said, and fishermen would continue with their hunt over the coming days. But critics of the practice say there is insufficient demand for the animals’ meat, which in any case contains dangerous levels of mercury. The annual dolphin hunting season opened Sept. 1 and is expected to continue until the end of February. Japan has self-imposed restrictions on dolphin hunting, allowing the catching of seven species with quotas for each prefecture in which they are hunted. In the case of Wakayama Prefecture, quotas for local fishermen are set just under 2,000 short-finned pilot whales and false killer whales, and Pacific white-sided, striped, bottlenose, Pantropical spotted, and Risso’s dolphins. “These restrictions are imposed so that the marine resources can be used sustainably,” a Fisheries Agency official said. Last season, the slaughter sparked renewed global criticism after U.S. Ambassador Caroline Kennedy tweeted her concern at the “inhumaneness” of the hunt. The first dolphin kill of the season came as the sharply split International Whaling Commission meeting opened in Slovenia on Monday, where Japan is expected to announce its controversial plans to resume Antarctic whaling. It is the first global meeting on whaling since the United Nations’ highest court handed down a verdict in March that Japan had abused a loophole in the international whaling moratorium that allows for lethal scientific research. DOLPHIN-KILLING SEASON: THIS SLAUGHTER MUST STOP! Taiji, Japan’s six-month-long dolphin slaughter, where over 20,000 dolphins are corralled into a cove and killed each year, is now underway. Dolphin Hunting 450x270 Dolphin Killing Season: This Slaughter Must Stop! The controversial six-month dolphin hunting season began on Monday in the infamous town of Taiji, but bad weather would delay any killing, a local official told AFP. The annual catch, in which people from the southwestern town corral hundreds of dolphins into a secluded bay and butcher them, was thrust into the global spotlight in 2009 when it became the subject of the Oscar-winning documentary The Cove. “The dolphin hunting season started today and will last until the end of February,” said an official of the Taiji fisheries association, adding the season for hunting pilot whales, which also begins today, will last until April. Dolphin Hunt 450x187 Dolphin Killing Season: This Slaughter Must Stop! Critics of dolphin hunting claim there is not a high enough demand for dolphin meat. Photo credit: Gregorio B. Dantes Jr. But bad weather on Monday meant there would be no hunting on the day, he said. Environmental campaigners are already in situ to watch the hunt, the official said. Last season, activists from international environmental group Sea Shepherd, who call themselves “Cove Guardians,” streamed live footage of the dolphin capture. Earlier this year, the slaughter sparked renewed global criticism after US ambassador to Japan Caroline Kennedy tweeted her concern at the “inhumaneness” of the hunt. 2DolphinEPA 468x246 300x157 Dolphin Killing Season: This Slaughter Must Stop! They say the hunt is only profitable because of the high prices live dolphins can fetch when sold to aquariums and dolphin shows. On Sunday around 30 people marched in Tokyo to protest the hunt, which they say sullies Japan’s reputation abroad. Q.1　What are Wakayama Prefecture’s views on the American film “The Cove”? 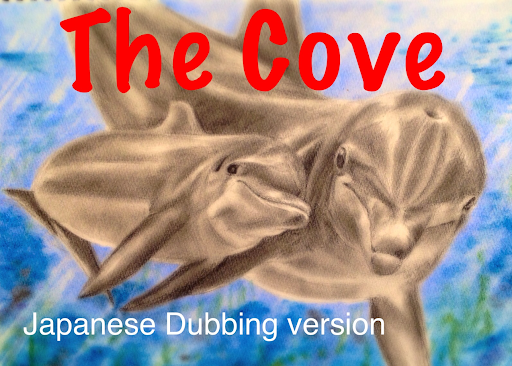 “The Cove” is a film which shows a depiction construed only from the viewpoint of dolphin protectionism. There are other countries and regions in the world where whaling and dolphin fisheries are conducted, and these countries and regions share commonalities in terms of geography, history, economy and culture. These countries and regions, however, are not mentioned at all in the film. A great number of people in the world eat meat. In order to do so, we cannot help taking the lives of carefully-raised domestic animals. Usually the killing of animals for food is carefully arranged, and it is conducted in out-of-sight abattoirs. In spite of these situations, “The Cove” filmed secretly the scenes of dying dolphins, and depicted their death in a manner designed to excite outrage. The filmmakers even seems to unapologetically boast about their secret recording techniques including them as a part of its feature. The film overstates mercury contamination by saying that dolphin meat contains 2,000ppm of mercury. This concentration, however, is very far from the actual figures. The film also includes distorted contents such as “the dolphin meat is sold in the disguise of whale meat to cover up the mercury contamination”, “the Japanese people don’t know that dolphin meat is eaten in the country because the media cover up related information”, and “Japan’s affirmation that it will continue whaling and dolphin fisheries is due to the Japanese classic imperialism.” These comments depart from the truth. As such, both the film-making procedures and the contents of the film are far from being acceptable for us. 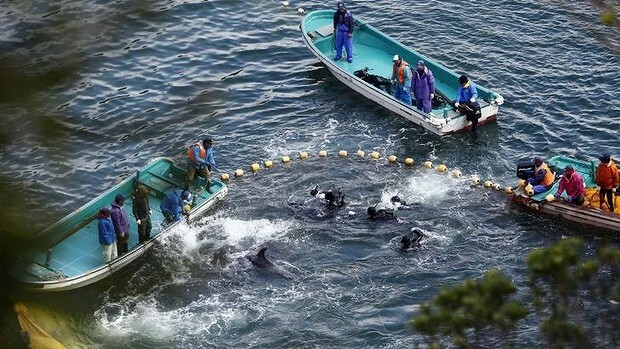 The Taiji dolphin fishery has been a target of repeated psychological harassment and interference by aggressive foreign animal protection organizations. Taiji dolphin fishermen are just conducting a legal fishing activity in their traditional way in full accordance with regulations and rules under the supervision of both the national and the prefectural governments. Therefore, we believe there are no reasons to criticize the Taiji dolphin fishery. It is inexcusable to criticize the Taiji dolphin fishermen, as the film does, based on one-sided moral standards and wrong information. Such criticisms are an unfair threat to the fishermen’s rights to make a living and offend the history and pride of the town. 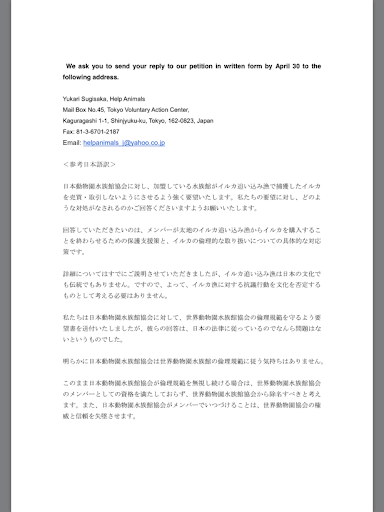 Q.2　Why does Wakayama Prefectural Government permit the dolphin fishery? Wakayama Prefecture regards the dolphin fishery as one of the significant fishery industries in the southern part of the prefecture. This comes from our belief that the dolphin fishery is a local traditional culture and that sustainable use and management of marine resources should be conducted based on scientific evidence. Taiji, located on the east coast of the Kii Peninsula, is a small town whose population is 3,500. Located far away from the centers of economic activity, the town has a 400-year history as the cradle of whaling, and has flourished over the years thanks to whaling and the dolphin fishery. The food culture and traditional events related to whales and dolphins still strongly remain in the town, and the dolphin fishery is still an indispensable industry for the local residents to make their living. Relevant authorities control fishing activities in order not to excessively endanger our natural resources. Whales and dolphins are also regarded as one of the marine resources which can be harvested in a sustainable manner under proper management. The national government carried out scientific research, and it sets harvesting quotas every year only for abundant dolphin species. Overfishing may bring about depletion of precious resources or even the endangerment of the species. Accordingly, the dolphin fishery is conducted based on scientific information provided by resource abundance surveys, and capture permits are granted to the extent that they do not represent any risk from the standpoint of resource conservation. Q.3　Europe and America quitted whaling for the purpose of protecting cetaceans. Why does Wakayama Prefecture continue whaling? Since the 1960s, the major whaling countries in Europe and America began to withdraw from the whaling industry not only because of depleted stocks but because it was becoming unprofitable. In 1972, the UN Conference on the Human Environment decided to adopt a 10-year moratorium on commercial whaling, and afterward there was an increase in the number of anti-whaling countries joining the International Whaling Commission (IWC). In 1982, the IWC adopted a temporary suspension of commercial whaling of 13 species of whales including large-size baleen whales, and Japan also ceased commercial whaling after 1986. We do not, however, accept the idea that only whale and dolphin meat is special, unlike beef or pork, and that therefore we should not utilize these resources as food. There are also other countries and regions in the world where people make a living by whaling. For them too, whale meat is an invaluable source of protein. Japan’s research whaling is conducted in accordance with Article 8 of the International Convention for the Regulation of Whaling. The research shows that other marine resources such as minke whales have increased. Abundant cetacean resources can be utilized as food in a sustainable manner and Japan is contributing to the international management of marine resources through its research surveys on cetacean resource abundance. On the other hand, the International Whaling Commission (IWC) has no jurisdiction over small-size cetaceans such as dolphins, and each country has the responsibility for management of these resources. Japan also controls the available number of small-size cetaceans for each species based on scientific surveys and permits their capture in numbers that do not affect the abundance of these resources. Geographically Japan is surrounded by oceans, and marine resources have been a significant source of protein for the people of Japan since ancient times. Whales and dolphins are a part of such resources, and it has been established that the Jomon people began to utilize them as food thousands of years ago. The southern part of Wakayama prefecture has little arable land with many precipitous mountains. Because of this, it has been natural for the local residents to take whales and dolphins which come close to the coast, and utilize them as food. In Japan, we utilize all parts of whales for various purposes not only as food but also as materials to make craft products. Since its beginning, the substance of our whaling has been different from that of other countries which, until petroleum came into use, killed an enormous number of whales for the sole purpose of obtaining whale oil, throwing the meat away into the ocean. For fishermen in Taiji, whaling and dolphin fishery has been their way of making a living. It has been a significant industry and part of the culture of the region which has a geographically harsh environment. In gratitude for the blessings of nature, Taiji people have the custom of regularly holding a memorial service for the whales and dolphins with a feeling of awe and respect for them. Farmers who raise livestock to later kill and eat them are the same. They feel a sense of guilt about killing their livestock and eat their meat with gratitude to nature. Criticizing these activities and inflaming the public through incorrect and wrongful information is just imposing one-sided values on others. Q.5　Japan is one of the major economic powers. The Japanese can live without eating whales and dolphins. Whale and dolphin meat and their preserved products have been a precious source of protein for the residents of remote islands, peninsulas, and villages located deep in the mountains far from the centers of economic activity. Even now, there are regions across Japan where they keep whale and dolphin meat as their traditional food, and many people who used to eat such meat in their childhood miss the taste, and wish to buy and consume it. Why should someone try to ban these people from eating whale or dolphin meat just because there are other kinds of food available? It is quite rare to find whale and dolphin meat in the markets but it is a fact that there is demand for them. Responding to such demand, there are fishermen who catch whales and dolphins, and they make a living by this fishery. Telling these fishermen to stop their whaling and dolphin fishery equals to telling them to abandon their livelihood. No one has a right to tell them to do so. Q.6　Dolphin fishery damages both the image and the national interest of Japan. In human society, dietary culture and habits are formed by various factors such as the climate, geography, history and religion of a region. Mutual respect, therefore, is very much critical. For instance, some religions strictly prohibit their believers from eating certain foods. They, however, do not denounce non-believers for eating such kinds of food simply because they are not allowed to. Dietary culture is a distinctive feature of each country, and no one has a right to decide which dietary cultures are right or barbaric. We will never be intimidated by those who try to impose their own one-sided values and preferences on us. We believe our pertinacious attitude does not damage either the image or the national interest of our country. Q.7　Dolphins are intelligent animals and friendly to people. We feel very sorry that the Japanese eat them. In order to survive, people take the lives of animals. In the Occident, hunting has been popular and people lived on animals hunted on land. Nowadays, they rely on stockbreeding, and they kill their livestock which they have raised with good care. In Japan, before having meals, we press our hands together saying the word “Itadakimasu,” to express our gratitude to the sacrificed lives that are in front of us as part of the repast. Not only dolphins but also other animals including livestock such as cows and pigs display emotion and intelligence, and we are able to feel an affinity with such livestock. They are the same creatures as we are in terms of living substance. We, however, cannot help killing livestock to eat their meat. Do people criticize these activities as barbaric? It will never be acceptable for us to blame the fishermen who hunt dolphins to make a living while observing the strict regulations which stipulate the species and the number of dolphins they can hunt. Q.8　As dolphins contain high levels of mercury, they are not appropriate for food. Mercury is a metal which exists widely in nature. Some mercury contained in seawater is absorbed by micro-organisms which are eaten by small-size fish, which are then eaten by large-size fish. Though such a food chain, mercury will be accumulated in large-size fish or sea mammals including dolphins. Studies show that dolphins, which belong to a higher level of the food chain, contain high levels of mercury in comparison with other fish and shellfish. There is no doubt, however, that the amount of mercury in a dolphin is too scarce to cause acute poisoning (sudden illness developed within a few days after intake of the food), while studies have not proven yet the level of mercury which will develop damage to health in the future, if people take it regularly. It is, however, assumed that the mercury taken into one’s body with dolphin meat is gradually excreted. Indeed, it is not harmful for the health of grown-ups who have normal dietary habits. As proof of this view, there has been no report of mercury poisoning in our history including in Taiji, where people eat quite large amounts of dolphin meat. Mercury, however, can pass through the human placenta and could possibly affect the development of the nervous system of a baby in the womb, although the effects are not so serious as to harm the child’s social ability. Therefore, in November 2005, the national government revised the “Advice for Pregnant Women on Fish Consumption and Mercury”. The revised regulation stipulates that the maximum level of mercury intake for a pregnant woman should be 2.0 micrograms (a microgram is one millionth of a gram) per week per one kilogram of body weight. This figure means a pregnant woman can eat 80 grams of bottlenose dolphin meat once in two months. Since Wakayama Prefecture contains regions such as Taiji, where people consume large amounts of whale and dolphin meat, mothers’ classes (health guidance for pregnant women) run by municipalities advise them to avoid consuming too much of fishery products which contain high levels of mercury, together with encouraging them to eat a well-balanced diet of sea food. Q.9　There is a possibility that consuming dolphin meat could bring about another Minamata disease. Minamata disease was caused by repeated consumption of fishery products which were contaminated by industrial wastewater containing high levels of mercury. There is no problem with repeated consumption of fishery products which contain naturally delivered mercury, if the amount is within the maximum limit of intake of mercury levels. If we devise ways to eat, we can eat even fishery products which contain higher levels of mercury than the maximum intake limit because the human body excretes half the amount of consumption little by little in approximately 70 days. Up to the present date, there have been no reports that naturally delivered mercury taken into the human body through sea food has caused any health damage. In fact, people in Taiji used to eat a larger amount of dolphin meat than nowadays as well as gaining income by shipping dolphin meat to other regions. There were, however, no reports of mercury poisoning. Q.10　Some dolphin meat may be sold with fraudulent labeling. Up to this time, no information concerning fraudulent labeling of dolphin meat has reached us. In case we obtain detailed information, we will conduct the necessary research in cooperation with both the national government and related municipalities. If we confirm the fact that fraudulent labeling has been conducted, we will instruct businesses in accordance with JAS (Act for Standardization and Proper Labeling of Agricultural and Forestry Products) to adhere to proper labeling practices. Q.11　Is the method of dolphin fishery conducted in Taiji Town inhuman? Dolphin drive hunting conducted in Taiji Town in past days was the fishery used by harpoon in order to capture after driving dolphins into coves as the film “The Cove” secretly shot. However, after the year 2008 December, the method was changed as the same way which is conducted in Faroe Islands in Denmark in order to make the time that dolphins feel pain shorter. By use of this method, the amount of time for slaughter was able to shorten one-thirtieth (around 10 seconds). Dolphin’s wound site is small and amount of bleeding is little. Moreover, since the year 2008 December, we can start slaughter and dressing of dolphins hygienically in the new facilities for disposal marine products in the Taiji Fishing Port. This is the same way that livestock is slaughtered in the special facilities in order to be kept out of sight. For above-mentioned reasons, the treatment of dolphins criticized by the film “The Cove” is the thing of the past, and it is totally different measure which we adopt now. Q.12　Does only Japan keep whaling and dolphin fishery? Both Whales and dolphins belong to Cetacean. Generally speaking, we call a cetacean which has over 4 meters-adult body as a whale and less than 4 meters-body as a dolphin. The International Whaling Committee (IWC) targets Great Whales as control subjects. 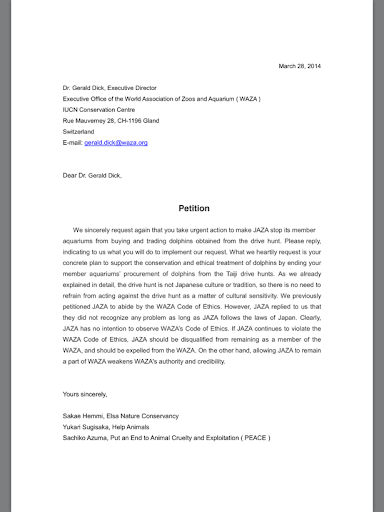 However, the IWC does not regulate capture of dolphins and Small Cetaceans. Even Great Whales which are controlled by the IWC, it is admitted to harvest by indigenous people in order to keep them alive. In the year 2012, 69 great whales are harvested in the US, 143 great whales are harvested in the Russian Federation, and 167 great whales are harvested in Denmark. Norway and Iceland raised an opposition and they keep commercial whaling. In the year 2012, Norway captured 464 whales and Iceland captured 52 whales. On the other hand, Japan does not conduct above-mentioned aboriginal subsistence whaling and commercial whaling. Japan conducts only research whaling. In the year 2012 fishing season, Japan captured 424 whales. Fisheries of Dolphins and Small Cetaceans, both of which are not controlled by the IWC, are under self regulation by each county in order to avoid resource depletion. In the year 2010, 2,429 heads were captured in the Greenland and 1,142 heads were captured in Faroe Islands of Denmark. In the year 2011, Japan captured 3,283 heads （in the year 2010, 6,577 heads） and Wakayama Prefecture captured 1,218 heads （in the year 2010, 1,557 heads） out of them. We understand that whaling and dolphin fishery are conducted in various regions all over the world. Japan, even Taiji Town, is not the only country and region to do whaling and dolphin fishery.